The 0-10 PWM Low Voltage Output Station is used for the control and automation of LED, CLF and CCFL lighting loads requiring either 0-10 or PWM for dimming control. 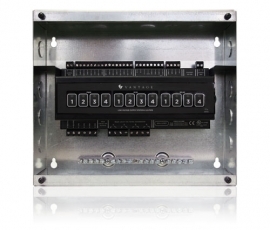 Each LVOS features four 0-10 outputs, four PWM outputs and four high voltage relays. The LVOS is firmware upgradable in the field through its ethernet bus or station bus inputs. It has the capability of supporting four dry contact inputs, two additional override inputs and is powered by 120-277VAC. The dry contact inputs can be used with motion sensors, light sensors, pressure sensors, IR input, magnetic switches and more.